The Spirit of Hurricanes and Blues...deep in SouthEast Texas...there is an old tradition that still thrives today. This recording was a labor of love...a gathering of hearts and spirits to pay homage to the tradition. On the final weekend of January, 2006 Uncle John Turner, with some of his friends, gathered in The Musik Faktory Recording Studio in Port Arthur, Texas (covered with a temporary blue roof after Hurricane Rita damages) to capture this tribute. 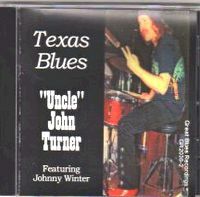 Uncle John Turner has performed with many renown musicians including Jerry LaCroix, Johnny and Edgar Winter, Stevie Ray Vaughan, Isaac Payton Sweat, B. B. King, Jimi Hendrix, Muddy Waters, and others. Joining Uncle John on this CD is Paul Orta, Floyd Moore, Roger Ward, Jack Edery, Little Ray Ybarra, Tonky De La Pena, Paul Choate, Joe Solis, Mark Solis, Johnny Lindow, Port Arthur Red, Eddie Broussard and Tomball Houston. Place this CD in your player and enjoy the celebration of the !-10 Hurricane Blues!